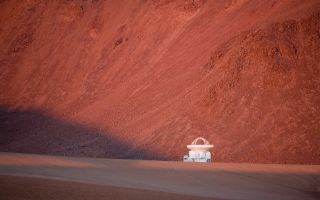 While ALMA is currently under construction, astronomers are already doing millimetre and submillimetre astronomy at Chajnantor, with the Atacama Pathfinder Experiment (APEX). While ALMA is currently under construction, astronomers are already doing millimetre and submillimetre astronomy at Chajnantor, with the Atacama Pathfinder Experiment (APEX) In this space wallpaper. This is a new-technology 12-m telescope, based on an ALMA prototype antenna, and operating at the ALMA site. It has modified optics and an improved antenna surface accuracy, and is designed to take advantage of the excellent sky transparency working with wavelengths in the 0.2 to 1.4 mm range.